You know that feeling you get when the wind is howling, the snow is driving sideways, and you HAVE to leave the house? It’s the worst feeling to freeze your face and breathe in the painful air. That’s why I designed this winter hood with a removable mask – to protect precious faces on even the harshest of days. 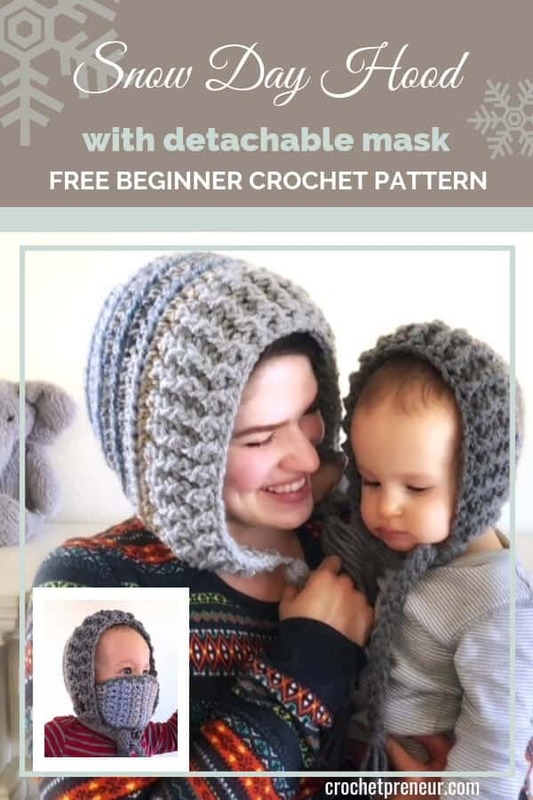 It’s Day 12 of 30 Days of Cozy and when you make this winter hood with its removable mask you’ll have no more unbearable breaths when you’re out shoveling snow or even just going from the car to the house. Simply button the mask to the hood and you and your loved ones are protected. It’s a perfect gift to make for family and friends in harsh northern climates and is quick and easy to make with size 5, bulky yarn. The pattern includes instructions for creating braids or tassels as embellishments. Follow along with the free pattern, below, for sizes 9-12 mos and women. Purchase the premium Snow Day Hood pattern which includes six size options (9-12 mos, toddler, child, teen, women, men) on Etsy or Ravelry. Yes! Send me my patterns! 50 – 150 yards Mary Maxim Marvelous Chunky (size 5) Yarn: 7 oz (198 g), 270 yds (246.9 m) per skein. I used the Waterfront colorway. The amount you’ll need will vary by size. I was able to make the men’s, women’s, and 9-12 mos sizes with one skein. 40 – 80 yards Mary Maxim Titan (size 5) Yarn [30 oz (85 g), 80 yds (73.15 m)]. I used the light grey for the women’s hood, medium grey for the 9-12 mos, and dark grey for the men’s. You’ll be working the hood in rounds without joining. Use a stitch marker to mark the beginning of each round. Move the stitch marker up to subsequent first stitches on each round. You’ll be working in rows now. 9-12 mos: Finish off MC. Skip to BRIM section. Finish off MC. Skip to BRIM section. Women: ROW 4: Repeat Row 2. ROW 6: Repeat Row 2. Finish off. Cut 12 strands of CC yarn at 36” each. Separate into two sets of 6 strands each. Fold one set of strands in half and pull the looped part through a lower corner of the brim – where the ties would go. Thread the ends of the strands through the folded loop and pull tight. With the strands firmly attached to the hood, braid the strands (you’ll have three sets of 4 strands each for the braiding). When you get toward the bottom, knot the end. Work a braid on the other side of the hood, matching the length. Cut 2 12” pieces of yarn and set aside. Using a book that is approximately 5.5” wide, wind yarn around the book 10 (20) times. Slip one of the reserved pieces of yarn under the wound up yarn and to the top of the tassel. Slip the tassel off the book and place the second reserved string about 1.5” down from the top of the tassel. Cinch tight and tie knot securely. Cut the loops at the bottom of the tassel. Add tassel to the hood by threading the ends into separate holes at the lower-edge, front corner of the hood. Tie the ends together and tuck the remaining ends. Trim. Instructions given separately for each size. ROW 2: CH1, turn, 2SC in the first ST, SC in each remaining ST across. ROW 14-16: Repeat Row 13 three times, decreasing one ST each row until you end up with a row of 4 stitches. Finish off and tuck ends. Go to section, below, to finish the edging. ROW 22: Repeat Row 13 seven times, decreasing one ST each row until you end up with a row of 4 stitches. Finish off and tuck ends. Proceed to section, below, to finish the edging. You’ll be working your way around the outside of the face mask. With CC and size K hook. Attach yarn with a SC to the right-hand corner of the mask, on the row with 4 SC. You’ll be working most of your stitches into the end stitches of each row. Each row is considered one stitch. ROW 1: SC in each of the STS going up to the straight section. *SC2TOG (decrease) across the next 2 STS* repeat from * to * until the end of the straight section. SC in each of the STS down toward the 4SC end. 2SC in the corner ST.
SC in each of the next 2 STS. SC in each of the STS going toward the straight section. Repeat from * to * across the straight section. 2SC in the corner ST. SC in each of the next 2 STS. SC in the same stitch as beginning SC. Add a toggle to each 4SC end of the mask, on the right side. Insert the toggle from the inside of the hood to hold the mask in place. Pam is the maker, designer, and blogger behind Made with a Twist and Crochetpreneur.com. She began crocheting at age 10 and published her first pattern in 2013 (39 years later, for those willing to do the math). Her designs are modern and super soft. She gets her inspiration from the colors and textures of the world around her. When she’s not crocheting, you can find her caring for her grandson and camping with her husband, Kevin. I am starting a non-profit organization for crochet patterns for hats, caps , bands,. Etc… I will be donating for cancer paints from infants, toodler, teens, to adults. Also trying to do in fabric as well. That is so wonderful, Janet! I wish you much success in your endeavors to help others! Wow, these look super cozy. perfect for the really cold weather! Happy Holidays to you and yours, too! Thank you so much! !